This is a recent customised Wordpress CMS website for a Dumfries-based event decor hire company. 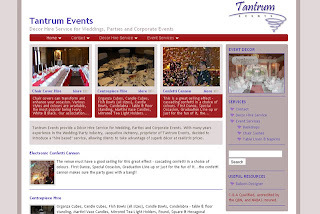 The wordpress installation is based on a customised theme in line with the existing printed marketing materials of Tantrum Events. The image galleries are controlled using the NextGen Gallery plug-in which also allow for the jwplayer slideshow effect based on random gallery images.